Zeager is a leading North American supplier of recreation and landscape surfaces that meet ADA, ASTM, CPSC and CSA standards. In addition to certified products, we also offer on-site testing services and installation support. Do you need assistance with installation, we can help. Want to reduce your maintenance or prevent surface break-down in the high wear areas, we can help. Need an accessible wear-pad for your turf or engineered wood fiber, we can help. Need an accessible pathway through your engineered wood fiber, we can help. Need an accessible but natural nature trail, we can help. Need someone to test your surfaces, we can help. WoodCarpet is available from the largest exclusive production network. This provides national support, broad experience and local sourcing. Adding TuffMats will offer huge maintenance savings and improved accessibility because of the unique mat design. And WoodCarpet Bonded pathways reduce maintenance and improve accessibility. No one offers more engineered wood fiber enhancements or expertise. If you are interested in a unitary surface, our RecBase line includes synthetic grass and indoor carpet, which are low maintenance and long-lasting. Both surfaces utilize an easy-to-install base that provides drainage, stability and fall protection. RecBase synthetic grass does not require infill and comes in a choice of colors and textures, including high-wear options for under swings and slides. Our factory representatives are NPSI trained so they can assist you in meeting safety and access guidelines. To look at some of our past projects and to learn more, visit us online at www.zeager.com. TuffMats eliminate the need to fill in holes under swings and slide exits, which means significantly less maintenance. 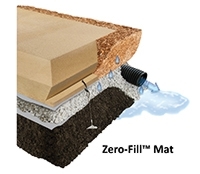 The new zero-fill TuffMat is a full-depth wear mat that requires no fill under or above the mat. Simply place the new zero-fill TuffMat on the ground and spread WoodCarpet around it.